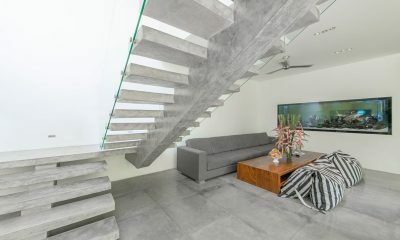 Villa Simpatico is a cool and stylish modern villa hidden in plain sight in the heart of the action in Bali’s trendiest neighbourhood, Seminyak. 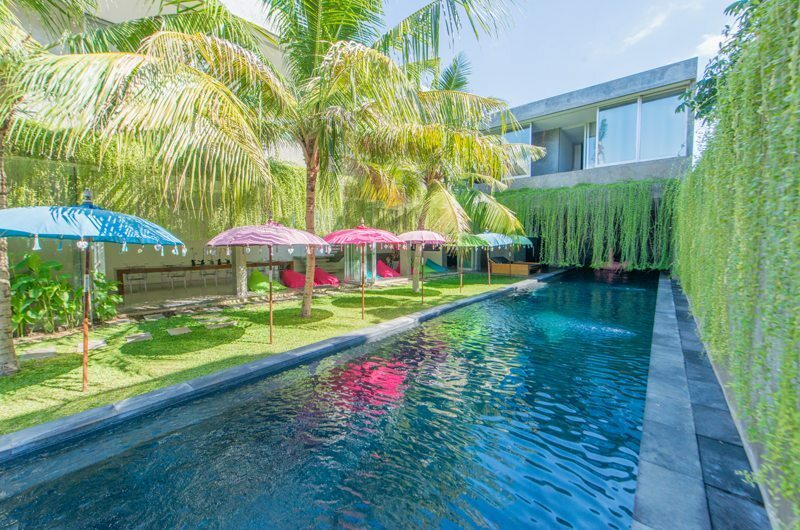 The spacious six-bedroom villa features clean cut modern architecture contrasted by a sparkling 25-metre pool lined by rainbow coloured parasols and lush tropical foliage. It’s hard to imagine a more stylish hideaway for large groups in such a central location in Seminyak – the closest gourmet restaurants are just minutes away on foot. 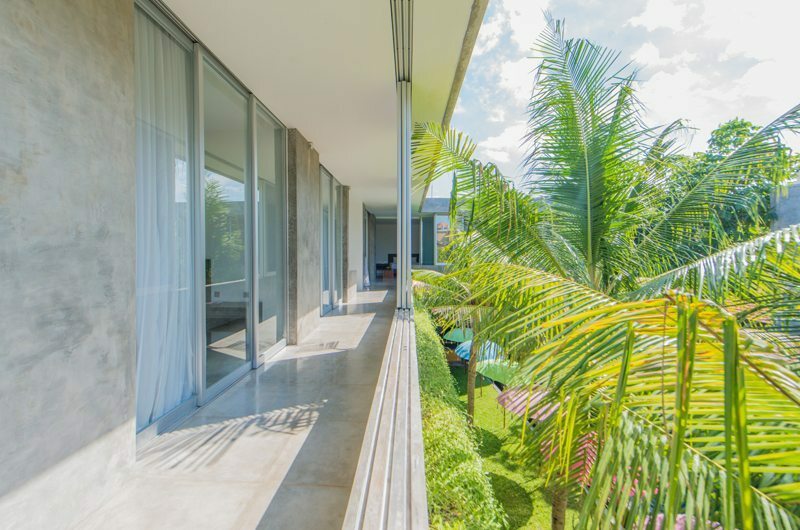 Villa Simpatico is all about angular modern architecture and splashes of bright tropical colour. 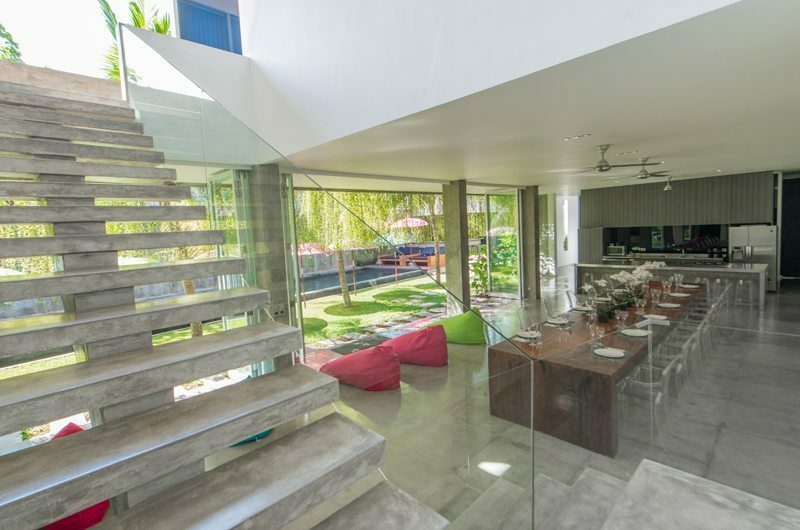 The sleek interiors ooze class, while the colourful pool and garden offer a private tropical oasis. 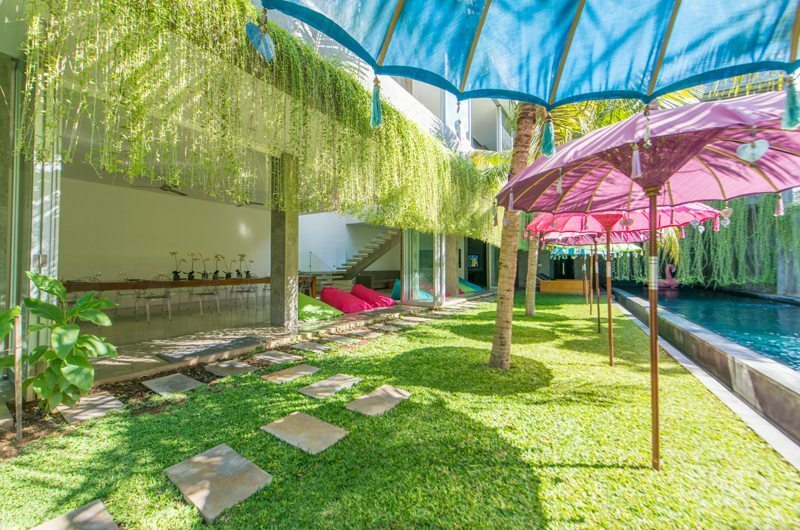 Sitting in a quiet lane, it’s easy to forget you’re surrounded by Bali’s best restaurants and shopping scene. 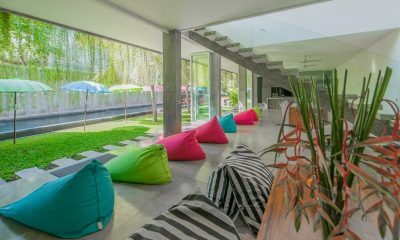 Villa Simpatico has a light and spacious living room furnished with a grey sofa, fun beanbags and a vibrant aquarium. 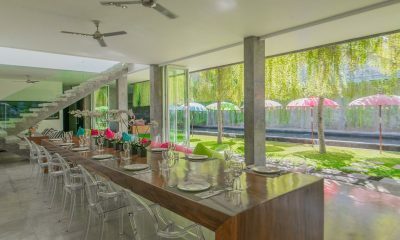 Villa Simpatico has a six-meter solid wood dining room table which can cater to 20 guests. 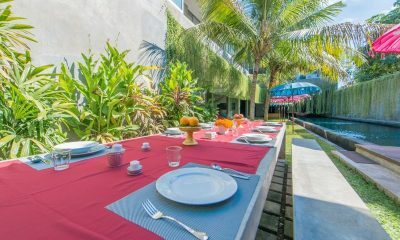 The outdoor dining table is set near the alfresco bar and barbecue area. 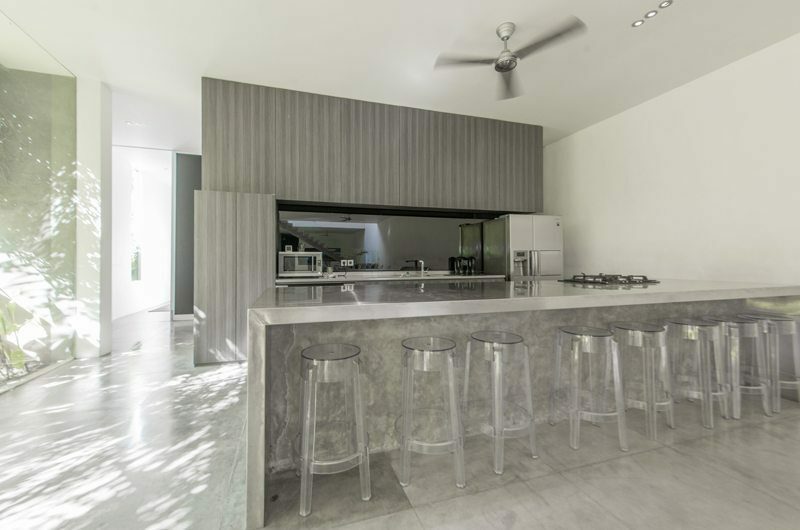 Villa Simpatico has barbecue facilities, a bar area and two big fridges for storing all of your drinks and groceries. 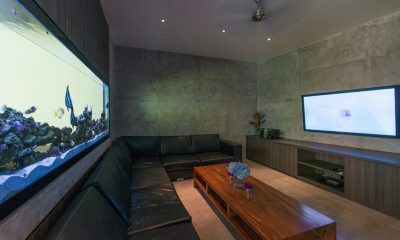 Located on the ground floor, Villa Simpatico’s media room is equipped with Samsung widescreen LED TV. 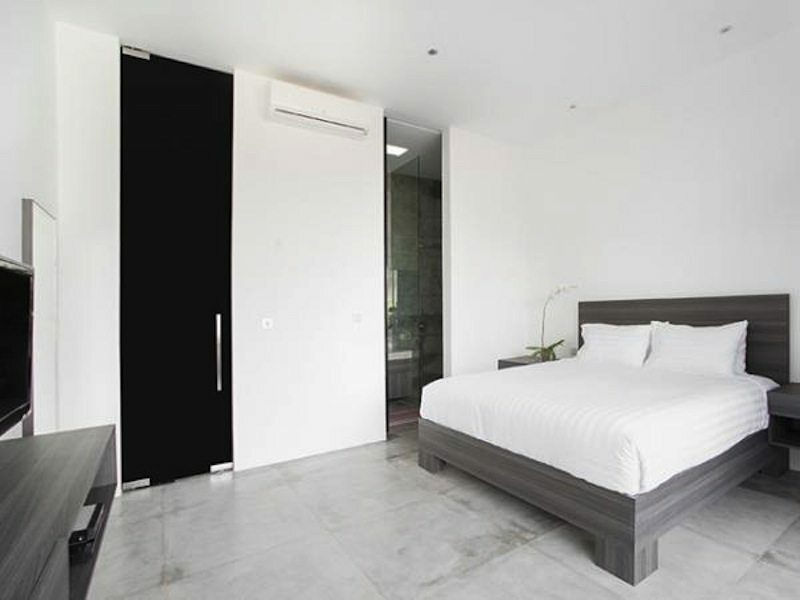 The room is air-conditioned and has its own ensuite bathroom with a shower. 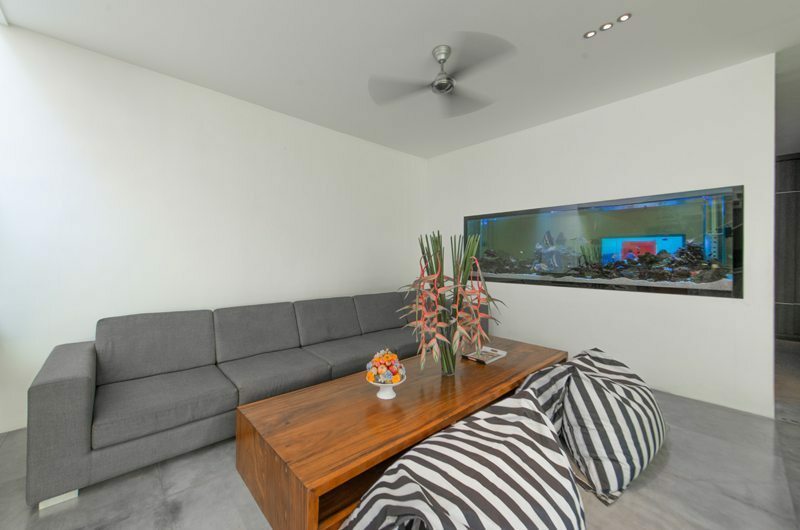 The media room can be converted into a seventh bedroom if needed. Villa Simpatico has a huge 25-metre swimming pool with a waterfall feature. 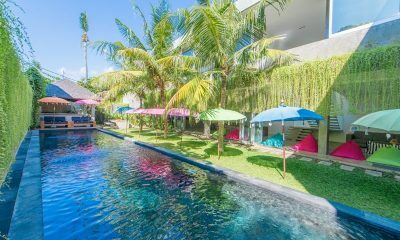 The pool is surrounded by colourful parasols, sun beds and beanbags. 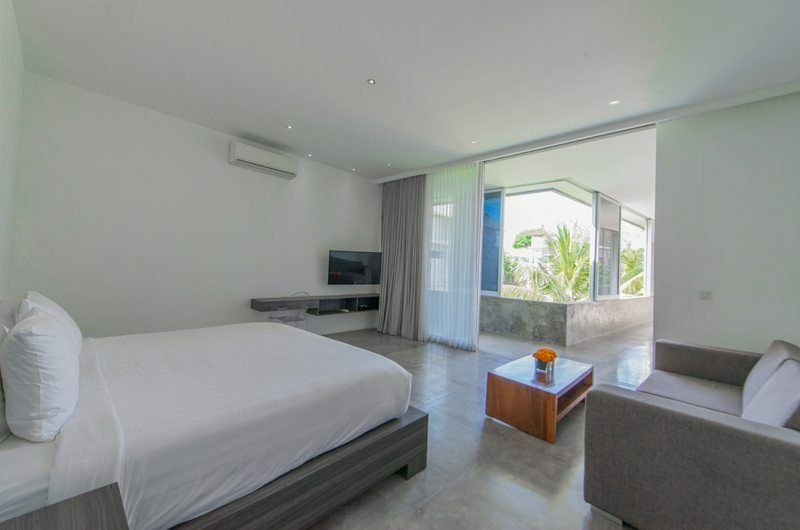 Villa Simpatico has six bedrooms, all with a king-sized bed. The bedrooms are all located upstairs. 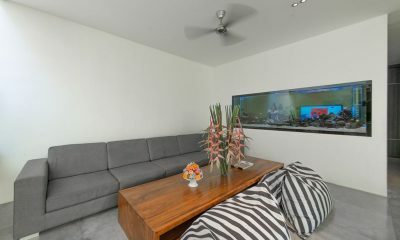 The downstairs media room can also be converted into an additional bedroom if needed. Villa Simpatico can accommodate up to three extra single beds which are available for an additional fee. 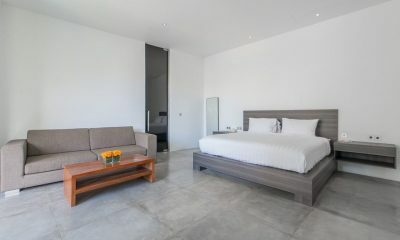 Villa Simpatico’s first master bedroom has a king-sized bed, TV and an ensuite bathroom with a bathtub and shower. 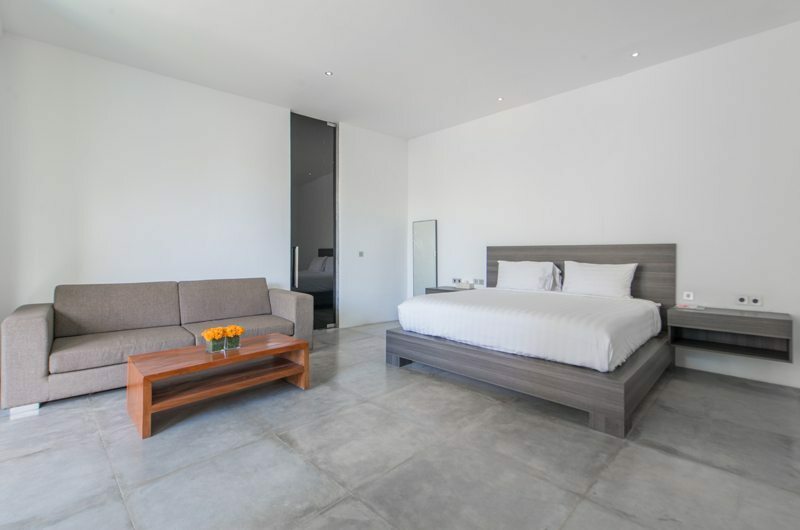 The second master bedroom also has a king-sized bed, TV and an ensuite bathroom with a bathtub and shower. 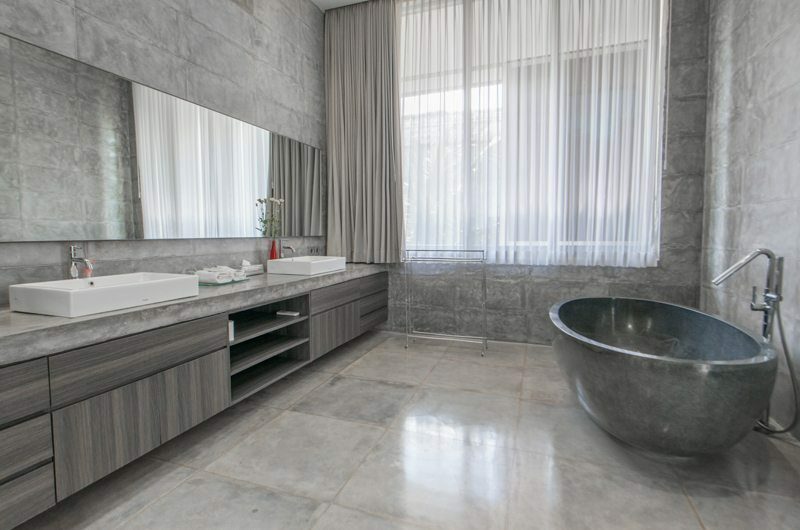 The third bedroom has a king-sized bed, TV and an ensuite bathroom with a shower. 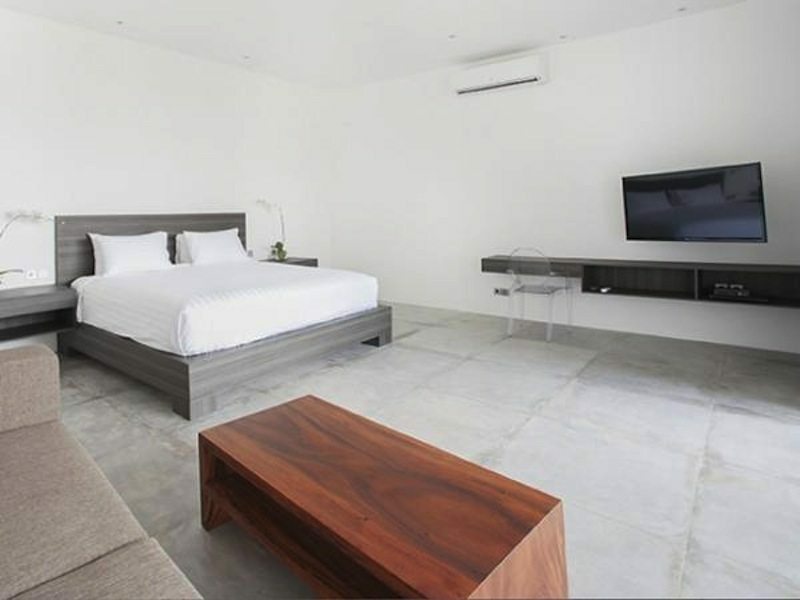 The fourth bedroom has a king-sized bed, TV and an ensuite bathroom with a shower. 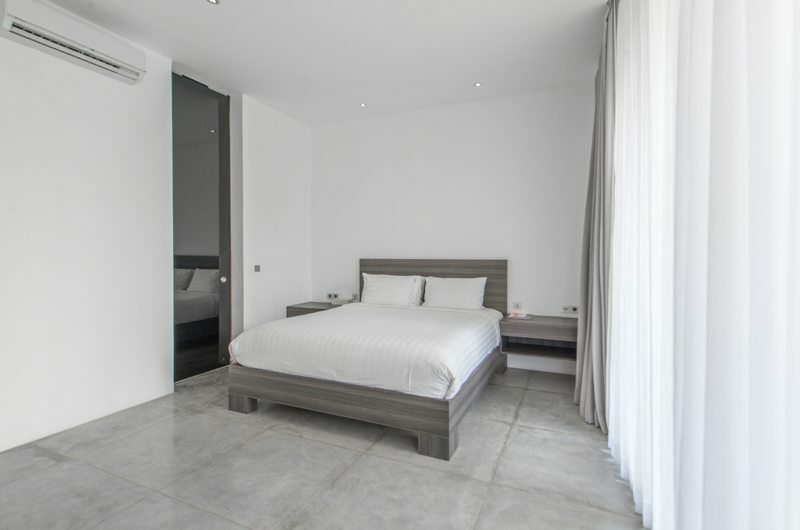 The fifth bedroom has a king-sized bed, TV and an ensuite bathroom with a shower. 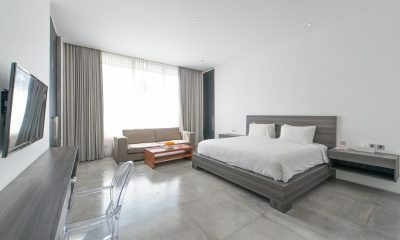 The sixth bedroom has a king-sized bed, TV and an ensuite bathroom with a shower. 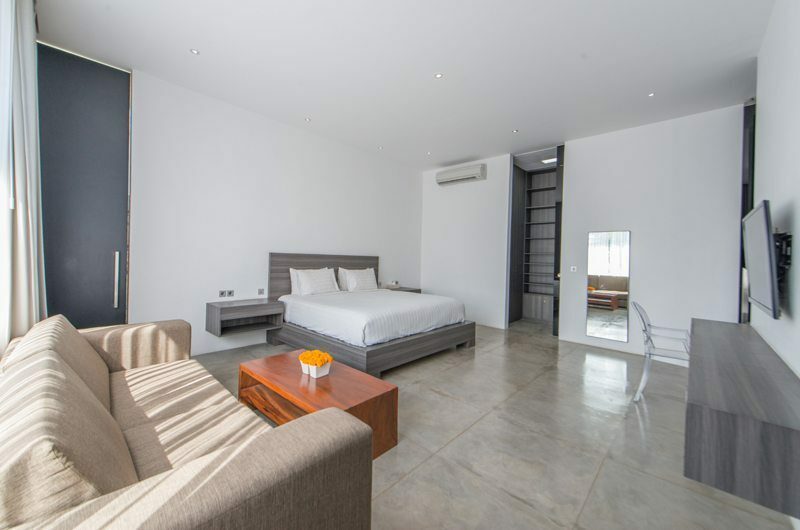 Villa Simpatico is a spacious six-bedroom villa. 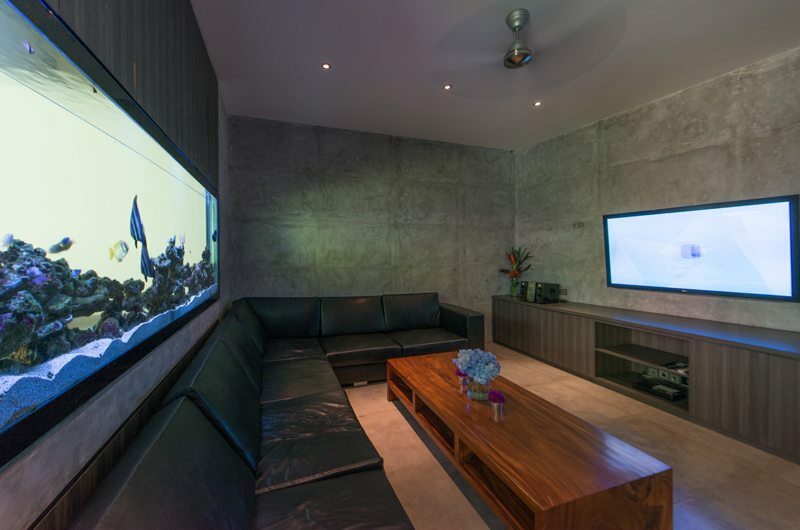 The villa includes generous living and dining areas, separate media room and a 25-metre swimming pool. 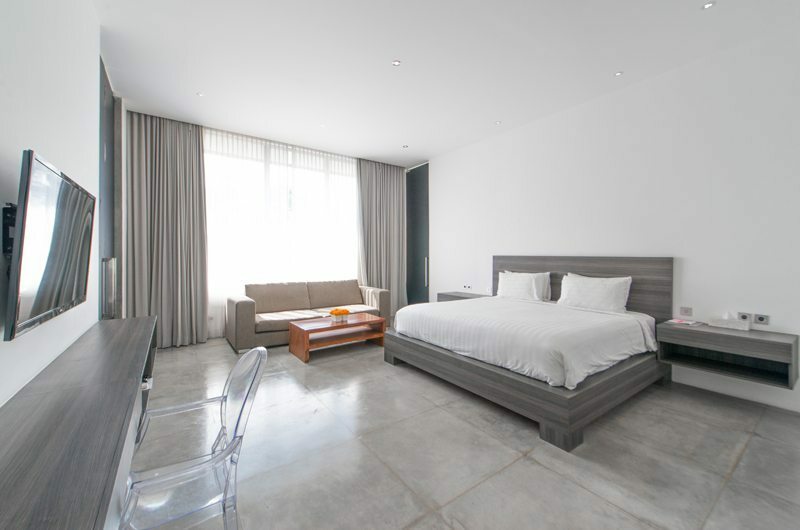 All six bedrooms include king-sized beds and ensuite bathrooms. Your stay in Villa Simpatico is made enjoyable by the professional staff. 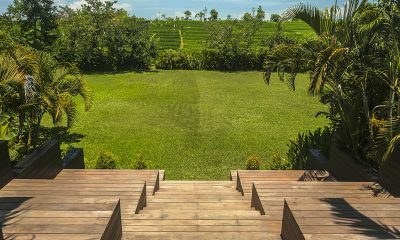 Villa Simpatico’s staff have been professionally trained and will do their utmost to please with their warm and friendly Balinese hospitality. 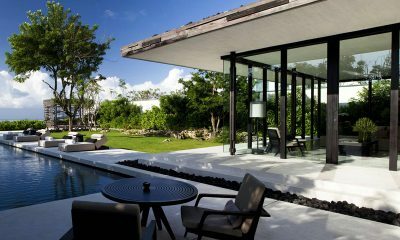 Villa Simpatico’s experienced and knowledgeable manager is responsible for the overall operation of the villa. The villa manager will oversee and coordinate the staff and property and assist you during your stay. Villa Simpatico includes 24-hour security. 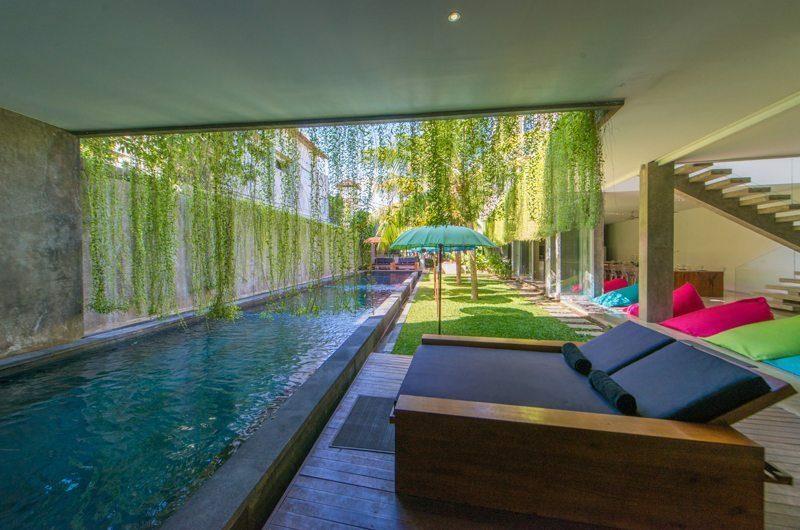 Villa Simpatico is in Seminyak, Bali. 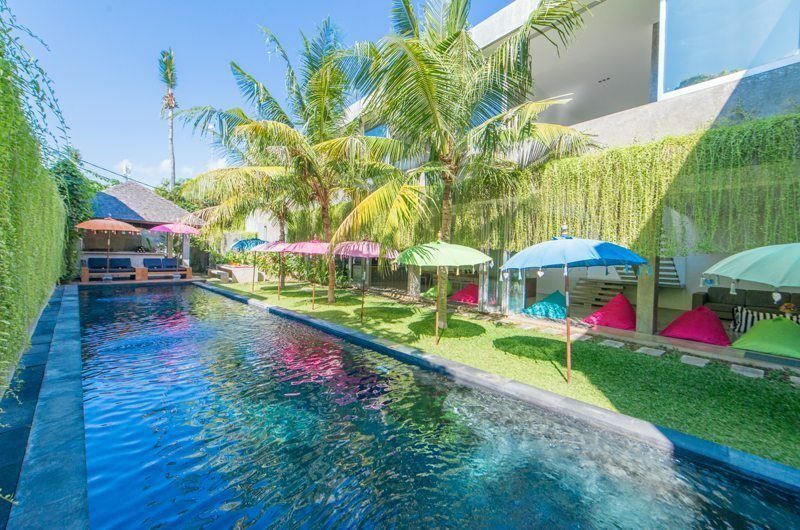 The villa has a terrific location in a quiet lane, minutes from some of Bali’s best restaurants and shopping. 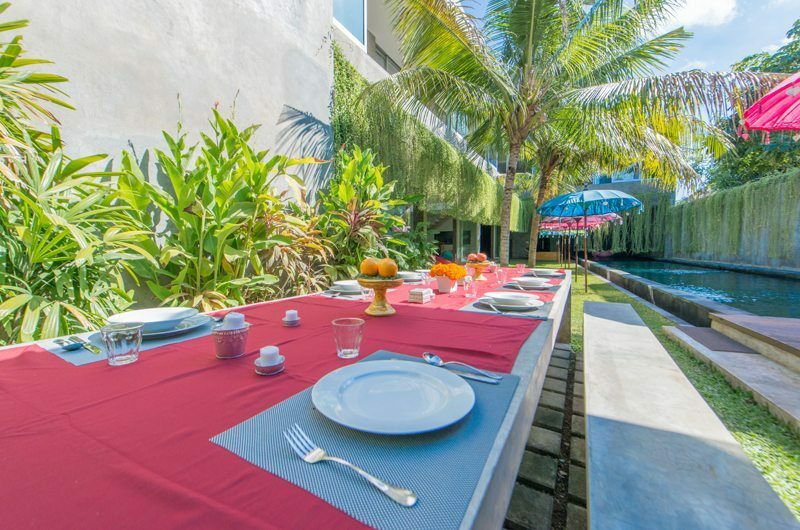 Villa Simpatico sits in a side street just behind Bintang Supermarket where you can pick up groceries and beverages. 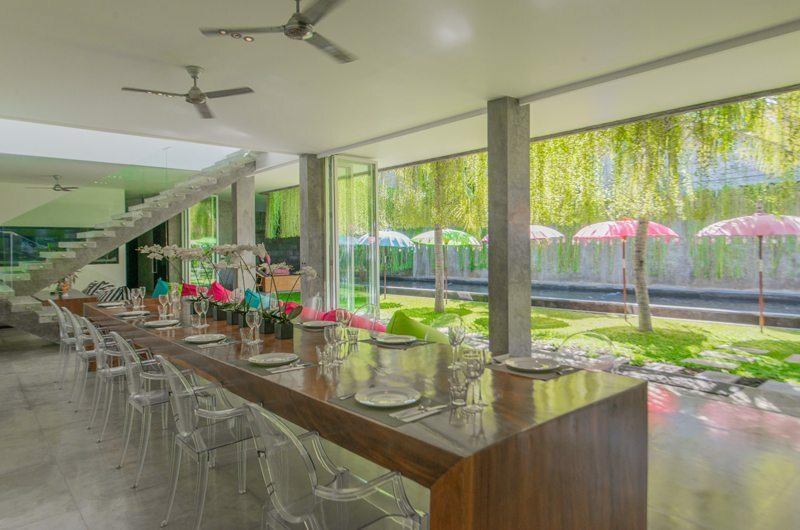 Great restaurants like Pearl, Shelter and Grain are within a short 10-minute walk. You can reach Double Six Beach in a 13-minute walk. 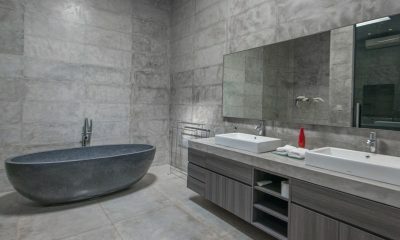 Villa Simpatico is located about 30 minutes from the airport. I had a fantastic stay in the beautiful Villa Simpatico. 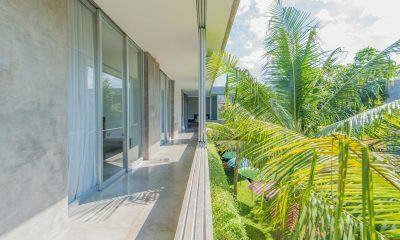 The pool, gardens and rooms are stunning and the service is amazing! I’m telling all of my friends and family to stay there. It’s near lots of unique shops and lovely day spas, and it’s also near the beach and lots of excellent restaurants. 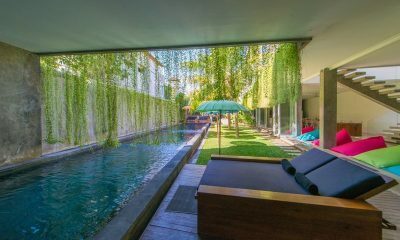 My best stay in Bali yet! New Years was good, hope you also had a good break. The villa was fantastic and the staff were amazing, don’t have anything negative to say at all. Will most defiantly book that villa again on our next trip. 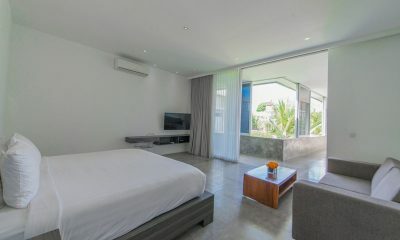 As it was our best accommodation experience since we have been going to Bali. 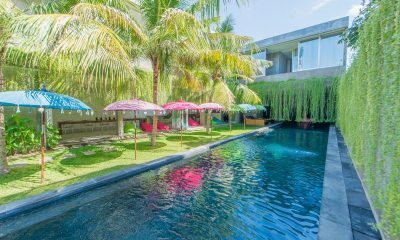 A large group of us stayed at the Villa Simpatico in Seminyak in Sept 2017 and we love it !!!! 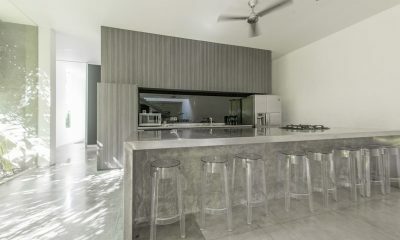 beautiful modern Villa with lots and lots of space we never felt on top of each other so many spaces to sit and relax or swim in the amazing pool … The staff where top notch nothing was too much trouble always there to help with a smile on there face , delicious cooked breakfast every morning . 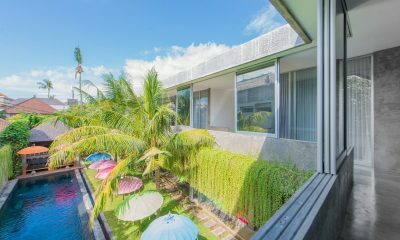 Ministry of Villas where also so lovely to deal with , overall I would definitely recommend not only this villa but I would use Ministry of villas for my next holiday . thank you so much . We stayed in september 2017 as a group of 11. 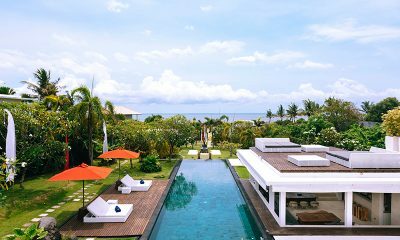 It was our first holiday in Bali, our first time in a villa and first time using Ministry of villas. The airport pickup was not stressful and we found our drivers easily. The villa staff and manager -Nanda – were lovely and our morning breakfasts were delicious. Nanda helped us organise tickets to waterbomb, assisted with day tour info and answered all of our shopping questions. 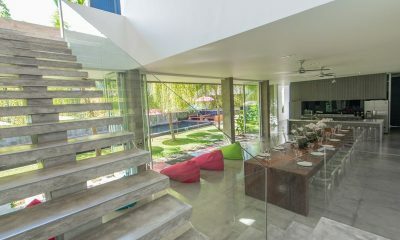 The villa is huge, modern, very clean and the gardens are beautiful. We loved relaxing on the bean bags by the pool – a few more rubber mats are needed as the pavers and area around the pool and bar is very slippery. 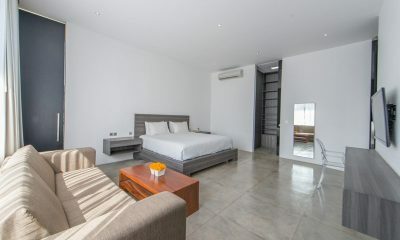 The villa is within very short walking distance to the main road where you’ll find shopping, restaurants and many taxis. Great to hear it was the first time you used Ministry of Villas! 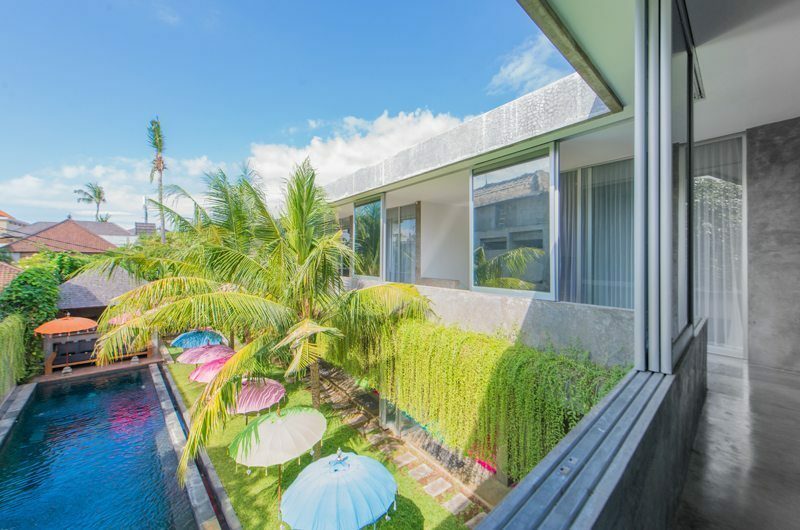 This is a great villa in Seminyak so it’s wonderful to read you and the group had a great time. We will pass on the recommendation for more mats outside as that’s an important point and easy to address. Thank you for the lovely feedback and we look forward to looking after you next time you are looking for a villa getaway. Amazing time…stayed in July 2017 with a group of six mums. 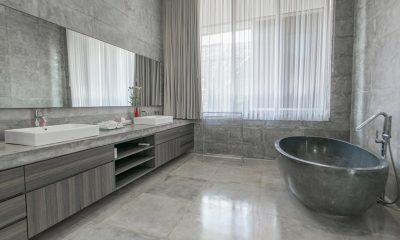 We each had our own room with en-suite which was amazing. We loved our time and everything was perfect! Thank you so much for the wonderful feedback. I’m so happy you enjoyed the villa and had a great holiday! 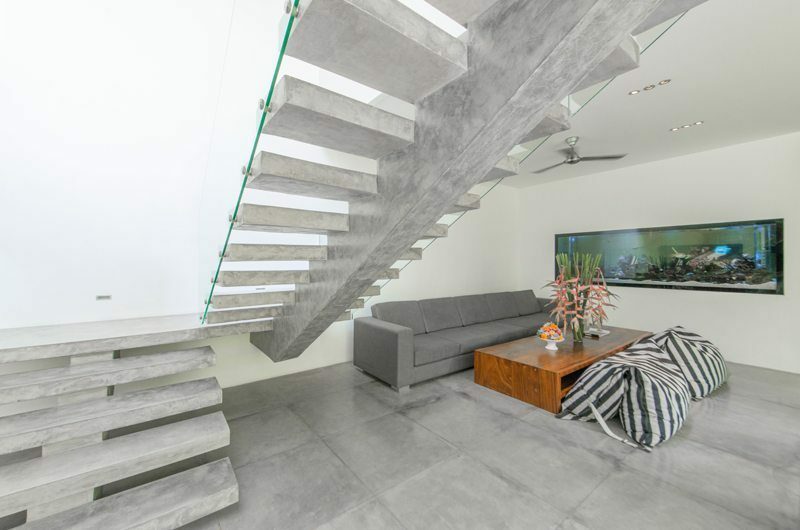 It’s so important that we find the right villa for our customers. 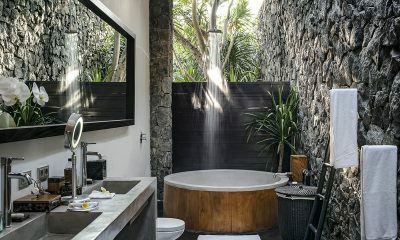 There are so many villas in Bali yet we hand-select only the villas that meet our expectations and that of our guests. This ensures the quality of the villa so there are no hidden surprises once you arrive for a well earned break! 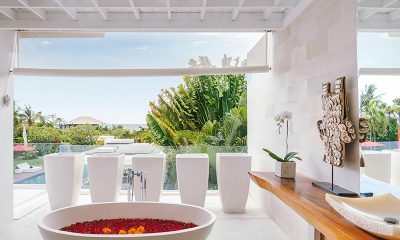 The Ministry of Villas team look forward to helping you next time you are planning a villa holiday. Regards, Sara & Ministry of Villas team. I stayed at Villa Simpatico with a group of 8 other photogrpahers for a workshop and I just loved it. 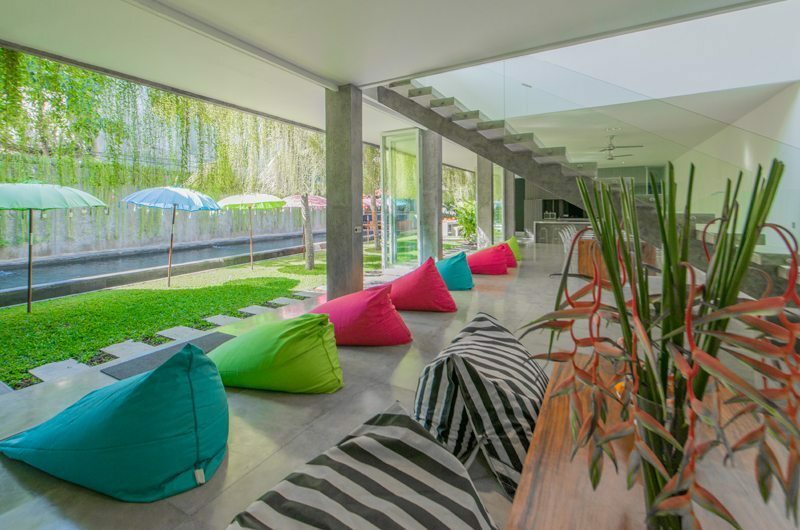 The villa was quite modern in design, there were gorgeous huge brightly coloured bean bags lining the edge of the pool and the whole space was light and bright. The pool was amazing, 25 metres! Was lovely to get up for a swim on a couple of mornings during our stay. Location was a bit tricky as my taxi driver wouldn’t drive down the laneway! It was a bit of a bumpy walk with my bags, but it was only a few minutes 🙂 I asked for directions once and found the villa quite easily after that. Loved it! It was the perfect option for our workshop but I would love to go back with friends and make the most of all it has to offer. Nanda thank you so much. You and your staff were wonderful! 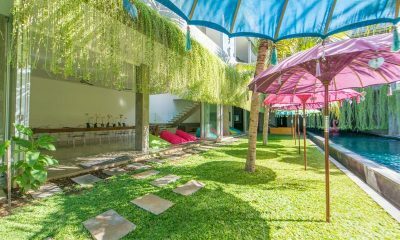 The villa is located in the heart of Seminyak with walking access to great shopping, restaurants, and the supermarket. You may decide never to leave the villa though. It’s incredible with everything brand new and supplied for you. Love that they had hairdriers in the rooms and filtered / drinkable water and ice. The staff and manager, Nanda, were amazing. They all spoke English and were so accommodating, helping me with my luggage and politely making me special vegetarian versions of the meals. I loved the freshly made watermelon juice every morning too. 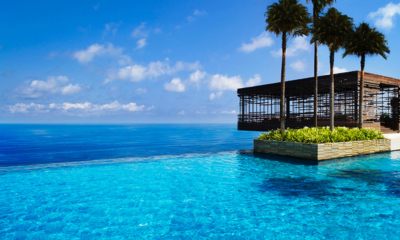 The perfect start to your Bali day. 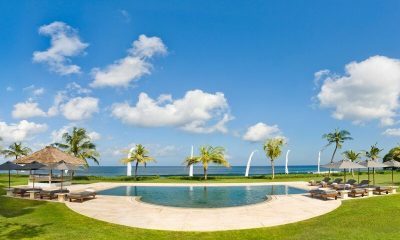 Villa Atas Ombak sits on 100 metres of prime beachfront land with incredible sunset views. 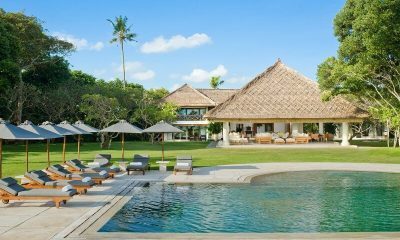 Villa Atas Ombak is in Batubelig, Bali.